pour controls. Let the good wines roll! 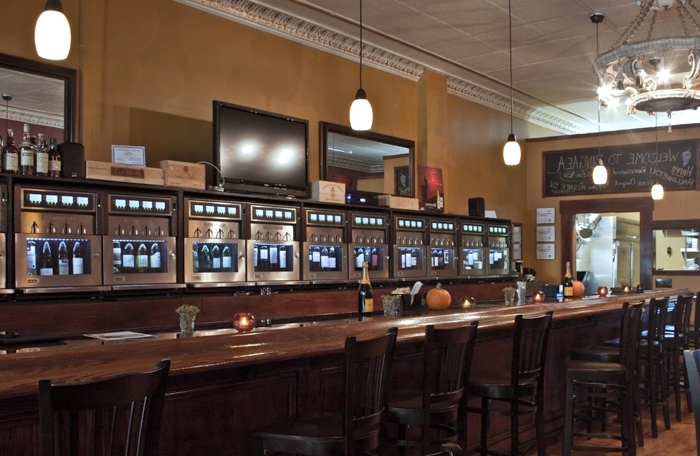 Like all WineStation models, this modular 4-bottle temperature controlled system is easy to set up, use and maintain. Ideal for showcasing and expanding by-the-glass selections and for staff controlled sampling. Increase sales and profits, reduce spoilage and product loss, and make your business stand out while offering your clients a better selection of price points and portion sizes. pour controls and detailed reporting. to constantly track, measure and improve results and performance. It includes a built-in product and staff database, customizable displays, staff assigned smartcards, detailed reporting and remote access capabilities. Ideal for both single locations and chains. Customer self-service, staff-service with assigned cards, pour controls and detailed reporting. Fine wines, fun times! Featuring all the advantages of the Premier model, the Premier PLUS also allows you to offer self-service wine discovery and 'try before you buy' sampling opportunities. Give clients the chance to explore, and they will keep coming back for more! Increase sales and profits while obtaining valuable data for CRM and business development purposes. Ideal for both single locations and chains. The most advanced system for home use. A wine lover's dream come true! Finally, a sophisticated, elegant, restaurant quality preservation and dispensing system for the serious wine lover. Enjoy 4 different wines at any time, at perfect freshness and optimal serving temperatures. Whether you're home alone, with family or friends - everyone will be impressed and no one will fail to notice this fabulous new addition to your home!